When it comes to putting bums on seats then look no further than the fans of Newcastle United. It’s truly remarkable that St James’s Park is still a sea of black and white after the painful years that fans have endured under owner Mike Ashley, and the even more recent heartache of the drop down to the Championship. It’s clear that the cathedral on the hill, perhaps the dominant structure in the city centre, will always hold great numbers on a match day, but do those same fans make the home team fearful of making a basic mistake? It will be no surprise to anyone to hear that the atmosphere in the ground, like many others, has taken a huge downward spiral in terms of singing, chanting and support for the players from start to finish. It’s a negative trend which has sadly impacted most clubs throughout the Football League. Of course you will still hear the odd chant for individual players and manager but those songs quickly break down when a player mis-controls the ball or fails to spot a forward pass to an attacking player. The jeers from the terraces are certainly not muted – at times they’re even louder than well known historical club chants. Newcastle eased passed Rotherham at the weekend with a four-goal margin but the negativity was still rooted in place. 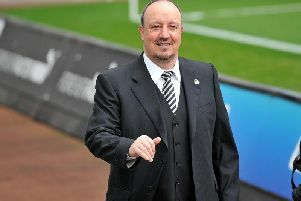 Whether it be Paul Dummett being cautious on the ball or Ayoze Perez attempting to get beyond his opposition, a certain section of the home support will still hurl negative gestures and words towards those players. We’ve became a fan base which seems to need a scapegoat, someone to blame, someone to direct our impatience and anger towards and it needs to stop, sooner rather than later. We are Newcastle United, the self pro-claimed “loyalist supporters in the world”. Granted, we can and always will support the team in numbers at home and away, but the scapegoating needs to stop, whether it be on the terrace or social media. This club is top of the league and looks destined to gain promotion so let’s show our appreciation for the club, manager, team and individual players. Of course we don’t have a team of world beaters, but we do have a team that will work tirelessly till the final whistle to take all three points. It’s time we all stood United.